No Shadow for Phil! An Early Spring for Us! 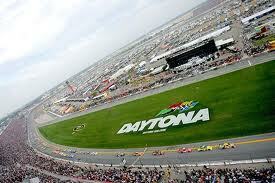 From the Super Bowl of football to the Super Bowl of love (Valentines Day) to the Super Bowl of racing (the Daytona 500), February has become quite the action-packed month. And, thanks to that ground hog named Phil from Punxsutawney, it looks like February is just a short span away from Spring! 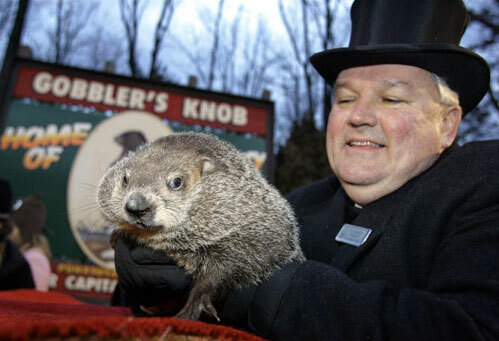 For us winter-weary folks in Des Moines and Central Iowa, Punxsutawney Phil says we’re on the fast track to outdoor living! Won’t be long until we’re out grilling, relaxing and entertaining outdoors on our decks, porches and patios around Des Moines and Central Iowa! Sounds like Phil is telling us we need to get our outdoor living enhancement projects on the fast track as well. In that regard, February is a very busy month for Archadeck of Central Iowa as we prepare for Des Moines’ rush to live outdoors this spring…summer, fall…year-round with a 3- or 4-season room or sunroom. We have two big events on our February calendar. First, the Archadeck franchise system gathers annually for a workshop to connect with our co-horts, franchise support team and key vendors and suppliers. This fun, educational and “re-charge your batteries” workshop has traditionally been held in January but was moved into February this year. I’ll be attending that workshop, held near Daytona Beach, on Monday, February 8th, thru Friday the 11th (and darn, I’m a NASCAR fan but can’t stay another week for the Daytona 500). I’m looking forward to the meetings and new “outdoor living” announcements and will have more “outdoor living” news to share when I return. Stay tuned. And if you’re thinking “patio” Des Moines (hint, hint), really stay tuned. Second, the 2011 Des Moines Home and Garden Show runs Thursday, February 10th thru Sunday, February 13th. You may notice an overlap with our annual workshop dates there, but we’ve got it covered! I’ll be back for the weekend shift; David is covering the setup and front end. Outdoor Rooms are a feature of the show this year. But, this will be the 14th year running that we’re displaying Archadeck-designed/built outdoor rooms at this Des Moines Home and Garden Show. We invite you to stop by our display, see examples of our outdoor living spaces, rooms and accessories and learn more about Archadeck’s approach to your project. You’ll find our Archadeck | Outdoor Living display space in the Lobby at the Main (East) Entrance to Hy-Vee Hall off of 3rd Street. The lobby, you say? What, we couldn’t afford a booth? Actually, its all a result of Polk County’s renovation project at Vets Auditorium. The Main Entrance at Vets Auditorium will be open, but the auditorium space itself is not available for the show this year. So, the show display areas have been condensed to be located all (mostly) within the adjacent Hy-Vee Hall (and its hallways and lobbies). If you come in the Main Entrance at Vets, you’ll follow the skywalk to Hy-Vee Hall…and the East Entrance Lobby…where you’ll find our Archadeck | Outdoor Living display space. Or, you can come directly in at the East Entrance to Hy-Vee Hall…and there we are. In conjunction with this show, we’ll be offering a Home & Garden Show Special; check the Special Offers section of our web site for details on how you can save $500 – $1,000 on an Archadeck project this spring. In addition, we have a limited number of complimentary show passes to give away. Yes…give away! All you have to do is…become a fan of, or “like,” Archadeck of Central Iowa on Facebook. Or, if you prefer Twitter, follow us at GoOutsidePlay. Or, do both! We figure if “The Social Network” is good enough for an Oscar Nomination, its good enough for us! Just “like” us on Facebook and/or “follow” us on Twitter and we’ll get that notification and be in touch regarding acquisition of the tickets – likely an exchange at (outside) the show. February is a super month – for football…for racing…for lovers…for groundhogs (and even me – my birthday is later in February). And, it’s a super time to start shaping your plans for transforming your backyard into that outdoor refuge you envision as the highlight of your leisure time. 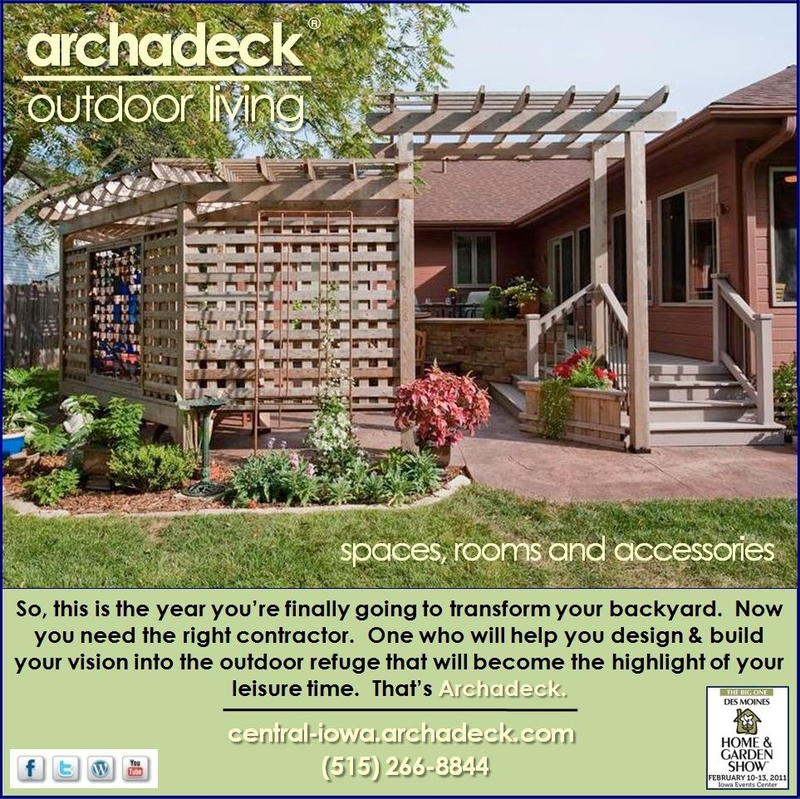 Archadeck of Central Iowa uses February to shape up our plans and services that help design and build the outdoor living spaces, rooms and accessories that Des Moines and Central Iowa envisions. And we’re offering Super Savings, too! And, if not February, we’ll be ready when you are. But remember, Punxsutawney Phil says there are now less than 6 weeks until we can spring out onto our patios, porches and decks. Don’t see your shadow! This entry was posted in 3-Season Rooms, 4-Season Rooms, Decks and Decking, Home and Garden Shows, Landscaping, Open Porches, Outdoor Furniture, Outdoor Kitchens, Outdoor Living, Patios, Pergolas, Pool and Spa Decks, Porches, Screen Porches, Sunrooms, Under-Decking, Wood-Alternative Decking, Wood-Plastic Composites. Bookmark the permalink.